The internet proved that entertaining and extremely low-budget movies, featuring a medium-length runtime can be made today. Just a decade or two earlier, films of this type, lasting between 20 and 40 minutes were considered an impossible venture outside of student exercises. Movies like The Defector are a perfect example that this is no longer true. 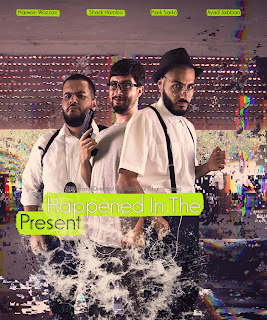 Now, a new film called Happened in the Present show that this formula can be applied to a YouTube work of art and end up as something regular viewers can easily enjoy. This film is the work of Mark Sarko, a director and hip-hop artist based in Germany that has clearly been around the entertainment industry. The plot presents a process of unorthodox investigation that begins with a body turning up in the bathtub of an apartment. From these, a duo of oddly mixed individuals starts their search for the truth behind this event, mostly using music and weird analytical capabilities. The film is based on a multitude of characters that continuously communicate with each other, but also a music-infused tempo that is fast and snappy. This makes the film into a one-two combo of funny and quirky dialogues, followed by musical segments and editing/VFX that are sometimes a bit over the top, yet still works for the movie�s overall tone and feel. This makes Happened in the Present a really engaging low-budget movie. Of course, it is not perfect on a few fronts - the acting is uneven and the locations look like they had been chosen mainly because they were available to the production crew. However, in spite of its flaws, the film feels more than genuine, clearly fueled by the passion for filmmaking. This is why I have no doubt that Mark Sarko only at the beginning of his creative journey in the domain of cinema. Watch the full Happened in the Present movie right here!